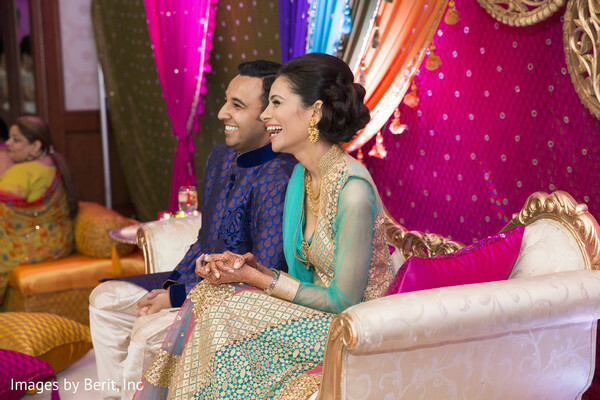 Even the skeptics are going to take a step back and wonder if Monique and Mayank’s wedding was a fairytale that came to life. We were in love with the first look portraits and the bridal party clicks, taken in the outdoors of the historic Pleasantdale Chateau, a venue that exuded timelessness and grandeur. Images by Berit did a spectacular job capturing the plethora of details before and during this glorious bash! This multi event celebration commenced with a vibrant Garba/ Sangeet at the Westminster Hotel. 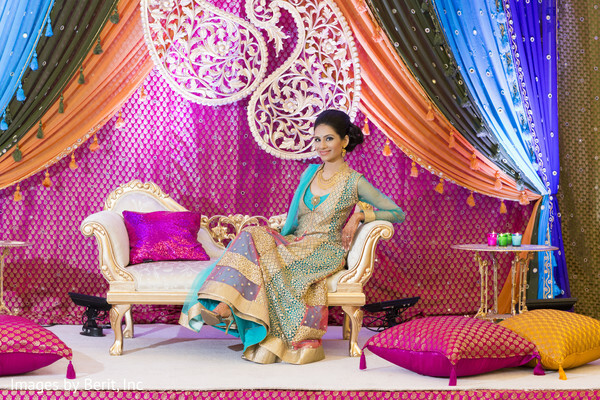 “We wanted colors that elicited joyful atmosphere and chose our decor and outfits to that effect. 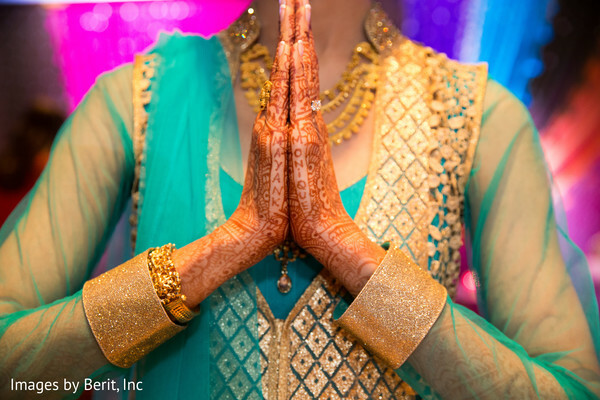 We also provided personalized dandiyas to our guests,” recalled the excited Maharani! Elegant Affairs achieved all that and more, via the stunning printed and embroidered drapes in bright hues like fuchsia, blue and orange. They also used Kairi motifs to add a hint of ethnic to the decor. Maharani Monique looked like a dream in her sea turquoise and gold anarkali. 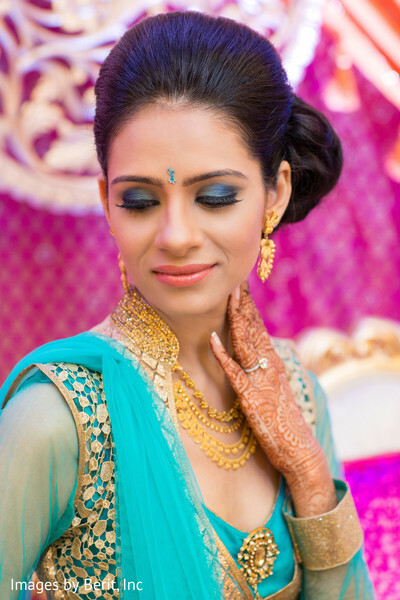 Her hair and makeup done by Sanjana Vaswani were truly showstopping - an elegant pulled back braided bun, midnight blue smokey eye, and a powdery blush glow finished Monique’s look. Chand Palace catered scrumptious Indian delicacies, and the buffet table decor featured colorful umbrellas with butta prints and sequins, and yellow drapes. Blue Moon Video Productions captured all the live action on film. This was vibrancy at its finest, and you have to check out the gallery full of inspiration and ideas! 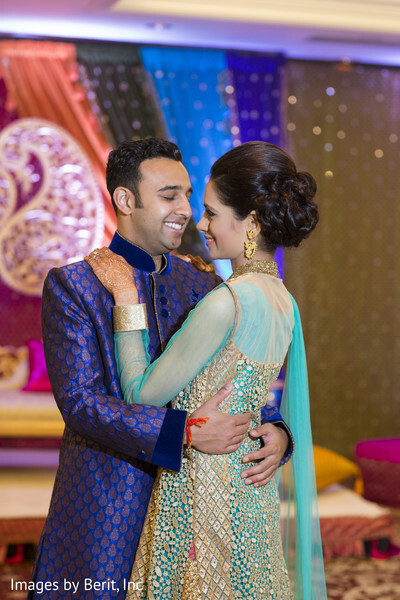 In part two, we’re going to share all the gorgeous details from Monique and Mayank’s romantic and decadent ceremony which started with a bang thanks to DJUSA’s incredible Baraat! Be back in a jiffy! 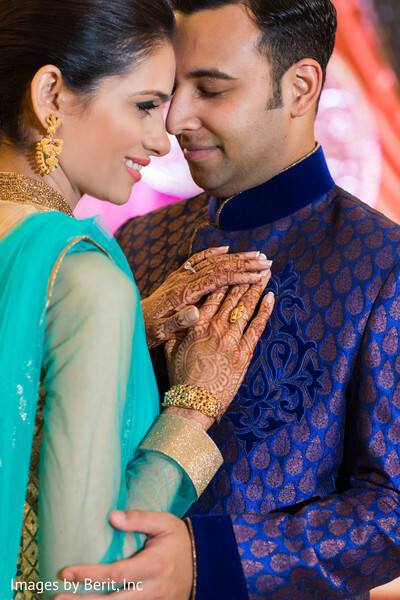 Elegant Affairs Inc., SV Bridal Concepts by Sanjana Vaswani and Chand Palace are members of the Platinum Guide. Love what you see? Explore their portfolios.